Since we value our dear customers above all else, we’re always excited to provide them with new, expanded migration opportunities. This time, our clients obtained two extra transferring options at once - the possibility to move data from Drupal Commerce and from the UberCart 3 shopping carts. 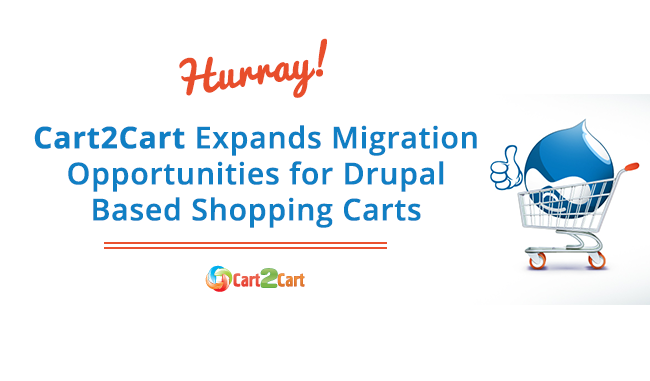 Both of the uplisted, Drupal based, platforms are free and open-source, both are quite popular and present merchants with great customization opportunities, so, until today, Cart2Cart has only supported transfers to them, from other carts. However, platform’s basic functionality can’t seem to satisfy trading ambitions of a lot of online merchants, disposing them to migrations onto more advanced e-Commerce solutions. Well, from now on, we provide such option too. Therefore, no matter if you’re looking for a quick way of migration to Drupal Commerce and UberCart 3, or you’d prefer to switch them for any of 60+ advanced supported platforms - Cart2Cart will help either way. Simply, register a new account, pick the desired shopping platform from a broad list of available ones, and have your entities transferred to it safely and accurately. Also, don’t forget about our Demo Migration option that allows you to move up to ten entities and test how everything works on a new store without paying a single cent. Cart2Cart team wishes you best of luck!